Each year, a few of the EyeCare Prime employees get the chance to volunteer at an Optometry Giving Sight mission trip. Jason, an EyeCare Prime employee who was selected to join the 2018 mission trip, wrote his recount of the trip of a lifetime below. My Boss: You have been selected to attend a mission trip! Me: Oh! That sounds great I responded. Where is it? Haiti is one of the poorest countries in the Western Hemisphere. Eighty percent of residents live in poverty, according to the CIA World Factbook. Haiti is one of the most densely populated and least developed countries in the Western Hemisphere. The Foreign and Commonwealth Office (FCO) advise against all but essential travel to the Carrefour, Cite Soleil, Martissant and Bel Air neighborhoods in Port-au-Prince due to the high risk of criminal activity. Note to self: Don’t tell any of this stuff to friends and family. As the pre-trip planning increased, and we understood our roles more, my anxiety grew mainly due to the unknown. 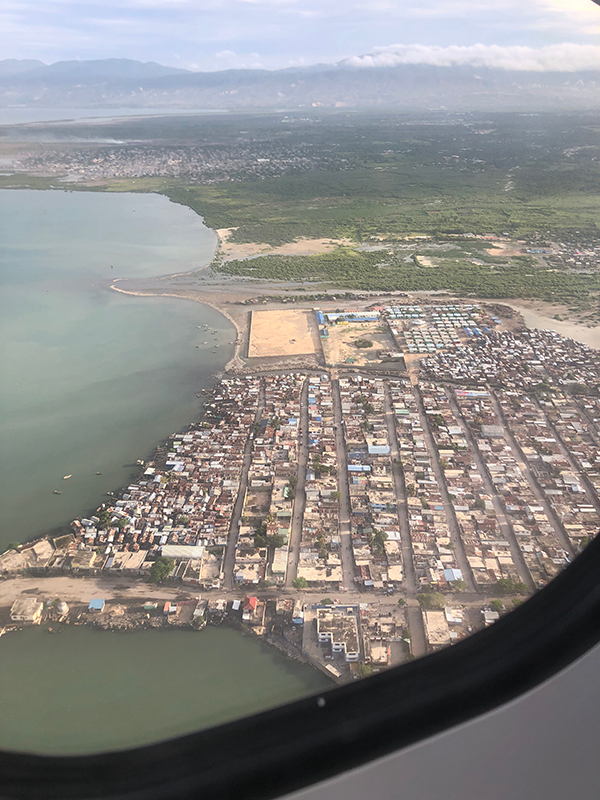 I quickly got distracted with daily life, and before I knew it the departure day arrived, and I found myself arriving in Haiti’s capital Port-Au-Prince. The drive to our first nights’ accommodations was an invasion of the senses. It was so different than our sanitized and regimented world of the UK & the US. There was noise, unregulated roads, and rubbish all over the place. The warm welcome of our hosts more than compensated for the unusual start to our trip. After meeting the other volunteers and trip leaders from VOSH, and interestingly two Americans who were born in Haiti, we had a good night’s sleep in preparation for the week ahead. Day one was a 7-hour drive in a minibus to Jeremie. This was another assault of the senses, seeing what multiple natural disasters and extreme poverty look like first-hand. When we arrived in Jeremie we went to the “hospital” to set up for our week’s work. The hospital looked more like a war zone than the mental picture I had preconceived. However, we all began setting up our stations and equipment for eye exams. Michelle, our trip leader, confirmed our target was to see 1,000 Haitians in the four days. This sounded tough, but we were all super positive and it felt like our energy and enthusiasm would get us through. We take for granted the most basic things such as running water. The majorly of the Haitian population are getting water from a pump in the ground and there is no hot water for a shower. Reading and writing are not a given, a high percentage of the people could not read so we had to adapt the eye test by using a “Tumbling E” chart which you ask the viewer to tell you the direction of the letter “E” by pointing up, down, left or right. Vision unlocks or blocks your potential in life. People have shared this theory with me before but when you can see the person’s occupation on the form and you determine their level of visual acuity the theory comes to life. Vision = Education = A Job = Money = Food & Shelter (This also works in the opposite way). Family members get very worried when the Island you are on has an earthquake, luckily for us, it was on another part of the Island. We all make preconceptions about people, especially when you cannot speak the language. For example, some people looked unapproachable and sounded grumpy but when you simply said good morning and asked how they were, their face changed to a smile and you could feel a connection. We all make preconceptions about food. The food in such a strange environment such as the crab and beef stew (Legim) that, frankly, looked like baby vomit, turned out to be delicious. I can tell you it took some effort for me to give it a try. Make fewer preconceptions and give people a greeting, and be open-minded about trying their food. You might surprise yourself. It could be your new best friend or a favorite new dish. People try and do the best for others, so many people brought others to the hospital in the hope we could help them without thinking about what help they needed themselves. The example that pulled my heart more than another was the 40-year-old son who brought in his Dad who was pretty much blind. The son did not even ask for an eye exam, he simply wanted us to try and help his father. Unfortunately, there was not a lot we could do for the Dad but we did manage to give the son some readers that he would use to read things for his Dad. After a week of cold showers, a hot shower and fresh towel feels like a luxury, just remember many people don’t have the same luxuries we do. Thanks to anyone who has pledged funds to this amazing cause. I can tell you every cent makes a difference. Thanks also for letting me be chosen to represent all of the donors and the company I work for on this eye-opening charity mission! Read about the Haiti outreach trip from the perspective of EyeCare Prime General Manager Mark Lindsey. With an estimated three doctors of optometry for a population of over 10M people, hope can be elusive to find as a participant in an optical outreach mission in Haiti. 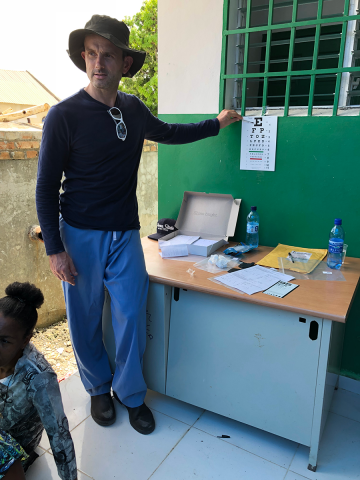 However, following a seven-hour bus ride and finding thousands of people in need of basic eye care, one loses track of statistics and begins to work on what one can do to help those in need. During our multiple twelve hour days, we saw infants, policemen, principals, nurses, and even some Haitians into their late nineties. Most of them had never had an exam in their lives up to this point. 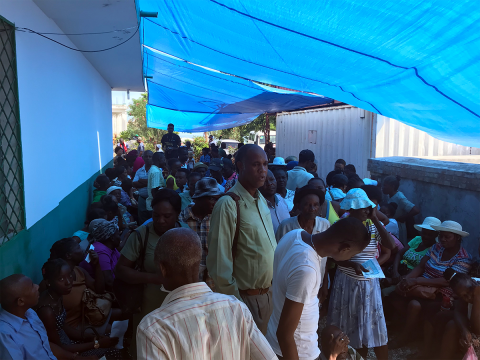 Our team of ODs (VOSH members), translators, and optical professionals set out to spend five days providing medical exams, glasses, readers, and sunglasses to the people of Jeremie, Haiti. 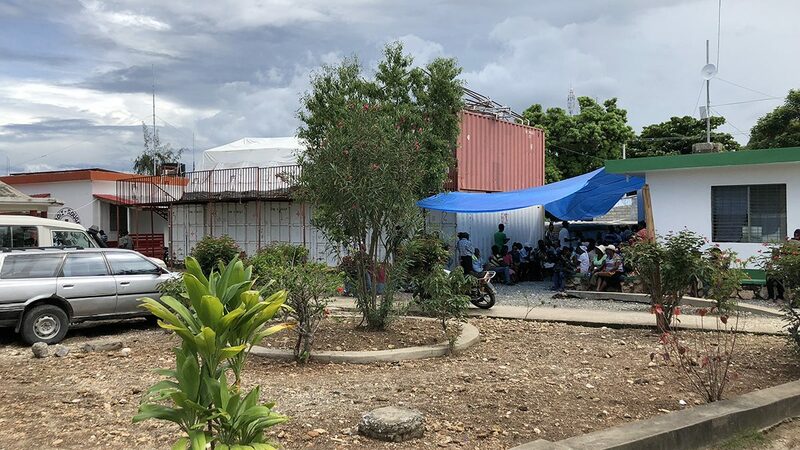 This remote part of the island still shows the horrendous impact of hurricanes, outright poverty, and a poorly supported medical infrastructure for its citizens. The average person lives on less than $2.00 per day. This was evident in the housing, the environment, and the lack of food available to the average Haitian citizen. We also ran into hundreds of patients who had never learned to read or write and we quickly adjusted our vision screening tools to accommodate their requirements. We were able to see over 1,100 patients and provide hundreds of pairs of glasses to those in need. Medicine and referrals for surgery along with custom glasses were offered to dozens of others we examined during our time in Jeremie. 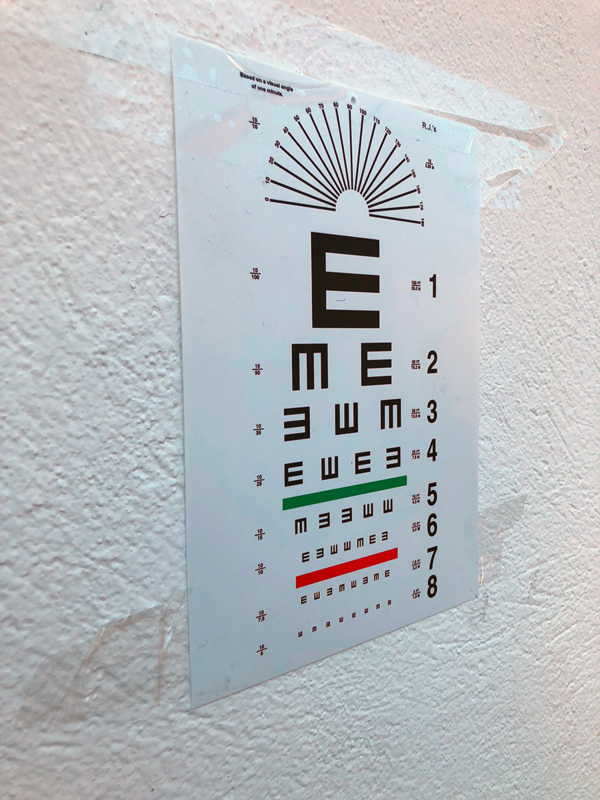 One of the most rewarding parts of the trip was our to visit the new school of Optometry that LensFerry is supporting via our donations to Optometry Giving Sight. Knowing that this school will teach and train ODs to serve the people of Haiti for years to come was an excellent and encouraging way to wrap up our last day of the trip. One case that particularly stuck out to me was Sean, a Haitian orphan, who grew up in an orphanage. He never knew his mom or dad and did not know how old he was, however, he guessed he was between 30 and 49 years of age. He was demonstrating signs of Presbyopia during our exam and I estimated he was most likely in his mid to late 30’s. I joked with him – through our translator – that we would need to cut him open and count the rings like a tree to determine his age. He laughed, and as I handed him his new + 2.50 readers. He then began to smile and commented to me that he and I would be friends at any age. Thanks to the LensFerry Gives Sight program, in partnership with Optometry Giving Sight and LensFerry practices, underprivileged people in impoverished communities were able to receive eye exams, glasses, and vision care. With every contact lens purchase, your office and your patients have contributed to a meaningful cause. When it comes to purchasing contact lenses, patients have an abundance of options. Between local retailers, online ordering and direct to consumer marketing, how can you set your business apart from the competition? One way to keep up with the changing landscape is by incorporating digital solutions into your practice. When evaluating a commerce solution, pick a business partner who is dedicated to helping those in need. Research shows that more than half of young people have purchased a brand or product in order to show support for an issue the brand represented. LensFerry offers your practice both of these powerful tools by providing an online contact lens store that also gives back to those in need through their partnership with Optometry Giving Sight. LensFerry makes a donation towards an eye exam for a person in need every time a patient makes a purchase through the platform. By implementing LensFerry in your office, you can offer your community a way to give back by providing the gift of vision to people in desperate need of vision care living in underserved areas. LensFerry will provide you the opportunity to broaden your reach to help not just patients in your practice, but patients all over the world. 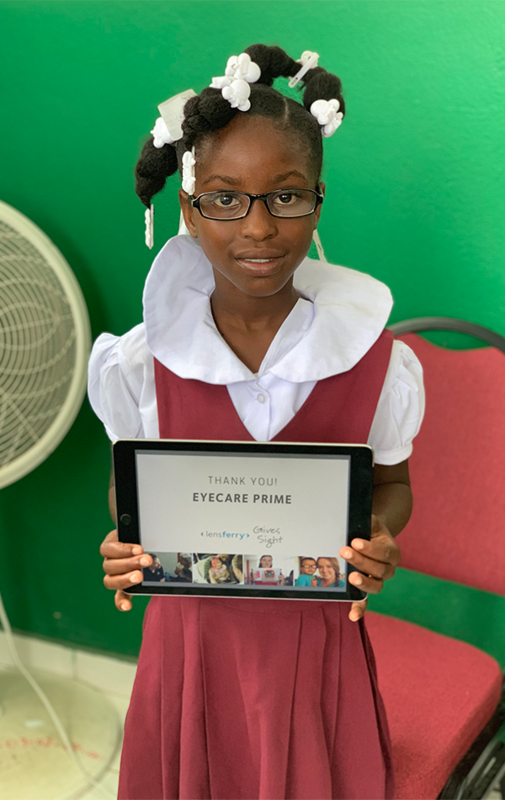 Thanks to the LensFerry Gives Sight program, in partnership with Optometry Giving Sight and our LensFerry offices, underprivileged people in impoverished communities were able to receive eye exams, glasses, and vision care. With every contact lens purchase, your office and your patients have contributed to a meaningful cause. EyeCare Prime is thrilled to share stories of patients, testimonies, and reflections from the various volunteer trips we have taken over the years in The LensFerry Gives Sight Series.